Yves Plamondon, who set up the GoFundMe page, said he has been a neighbor of the Nance family for 23 years. He noted that the family has lived in their home for over 25 years and Melody Nance has been the treasurer for the neighborhood’s homeowners’ association for 25 years. Plamondon said that while the origin of the fire has not yet been determined, he said Steve Nance speculated that he thought there was a gas leak from a car that he was working on in his garage or a lawn mower. “That’s just speculation right now, we really don’t know at this point,” he said. In a video published about the house fire, Fox8 News explained that the fire began at 3 p.m. on Saturday afternoon and only took 16 minutes to consume the home, taking with it a riding lawnmower and a vintage car before going into the attic. Plamondon told news crews that Steve was able to get his wife, daughter, and three dogs out of the house, but was unable to get any valuables or the family cat. Plamondon said he went over the following day to see what he could do for them. Following the fire, Plamondon said the family was staying in a hotel for a few days and have now moved to an Extended Stay hotel while they are looking for a more permanent place to stay. Plamondon added that the family is starting from scratch. Plamondon said he set the GoFundMe goal to $5,000 but said he would be happy to see more. “I was just thinking of giving them a head start right now,” he said. “I’ve already made one withdrawal from the first day to give them this week and people have dropped cash donations, as well. I’ll be seeing them late Friday, so if anyone has anything, they are welcome to drop it off,” he said. 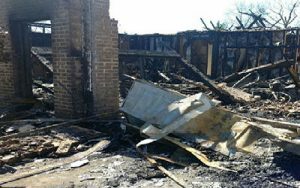 For more information or to make a donation, visit the GoFundMe page, https://www.gofundme.com/home-fire-relief-for-nance-family. 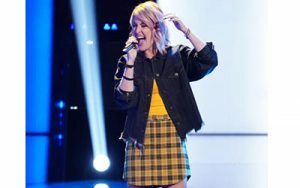 On Monday, March 11, residents around Kernersville were excited to hear their town mentioned on the popular vocal show The Voice after Ciera Dumas performed during a blind audition in front of the judges on national television. Dumas, a 2015 Glenn High School graduate, said singing is her passion. Dumas grew up singing and started singing in front of people while leading worship at The Summit church. In high school, Dumas was co-president of her acapella group, Vocal Point, under the direction of Carol Earnhardt. She shared that she likes to sing old school, soulful ballads, as well as pop and R&B style music. Ever since she was a little girl, Dumas said she has dreamed about being on a show like The Voice. “I remember watching those competition shows. I remember watching Kelly Clarkson and I wanted to do that and wanted to see myself on one of those shows,” she said. Dumas said she originally tried out for The Voice for season 15 and made it through to the blinds; however, she was not able to go because she had to end up having a nodule removed in her throat. Dumas had also tried out for X Factor, having auditioned her freshman and sophomore years in high school, but said she didn’t make it. Dumas said it was while she was living in Nashville that she tried out for this season’s competition for The Voice and made it. Although she has auditioned several times and sung in front of large groups at church, Dumas said she was still nervous when trying out for this season’s competition. “I was more-so insecure,” she said. Once she was accepted into the competition, Dumas said she was in shock. “I could not wrap my mind around the fact that I had gotten picked to do this. It was more of a mental game of whether I was going to believe in myself to do this, possibly from being rejected before, but also when you are there, you’re there with the best of the best in the country and it’s very intimidating,” she shared. During the competition on March 11 (episode 5), Dumas chose to sing, “Tell Me You Love Me,” by Demi Lovato. “I have always loved Demi Lovato, and especially that song because I can connect with it and the heartbreak, and I was able show my voice with the song,” she said, as she explained that she rearranged the song a bit to make it a little more gospel and soul to fit her style. Dumas explained that there was a lot of preparation leading up to the blind audition. “I started out super strong because it felt like a dream, but when the judges turned around, I got a little freaked out, but then got a hold of myself,” she said. Dumas was joined by her dad, mom and best friend, Sarah, who were watching her live on stage. Dumas said it didn’t really hit her about what happened until she saw a feature of the Best of the Blinds, when Carson Daly and Adam Levine were talking about her in an interview on television. “It just hit me and I thought, ‘Adam Levine is talking about me right now,’” she said. Although she went into the blind audition with the mindset that she would be selecting John Legend or Kelly Clarkson as her voice coach going forward, she changed her mind after talking to the judges. Dumas said for the next round, the Battle Round, Adam will pick her song. “It’s a little scary, but it’s a little bitter-sweet when you pick your own song because you carry the weight that if you didn’t do a good job, it’s on you,” she said. Dumas said she has already had the chance to work with Levine and said he is very laid back. “He gave me some tips on how to do certain things, but he also trusted me as an artist to do the things I felt I needed to in a song,” she said. Dumas said she has also enjoyed getting to know the contestants. Dumas said she is so thankful for all the support she has received. 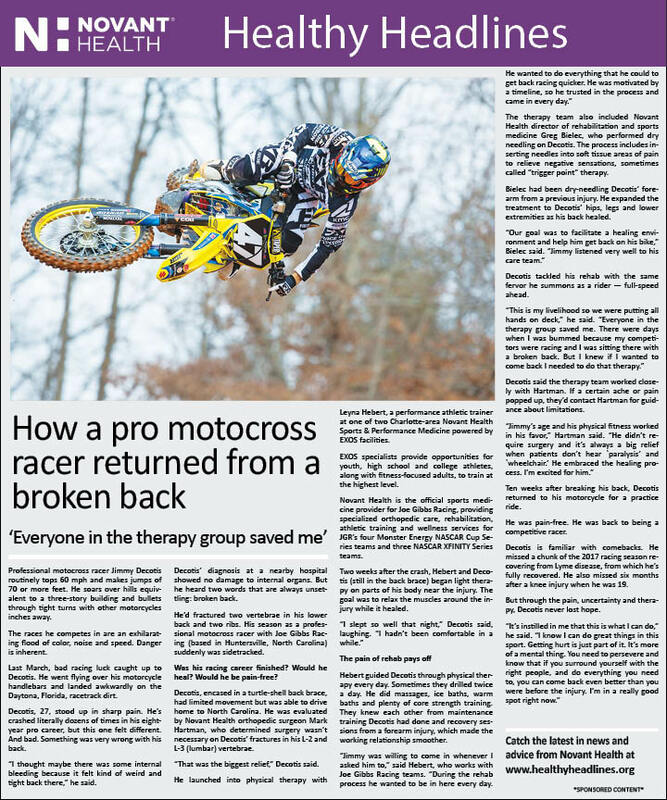 “The support that I’ve gotten from everyone is overwhelming. I couldn’t have asked for anything better,” she said. Since her performance, Dumas said her Instagram account jumped up to over 3,000 followers. The Voice appears on Monday nights at 8 p.m. eastern time on NBC and Hulu. Walkertown High School student Angelina Rice has a free period before her Graphic Design class at the Career Center. She likes to work on her designs so much that she regularly comes in early and spends her free period in the classroom, said teacher Stephanie Messer. 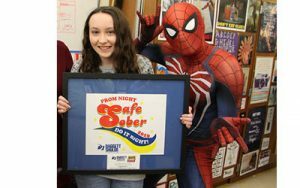 On Friday, March 15, that dedication and focus – and her creativity – paid off when Rice learned that her design had been chosen for the 2019 Safe Sober Prom Night t-shirts. Messer and the students in the class learned that she had won when Deadpool and Spider-Man burst into the classroom, followed by the mayor of Winston-Salem, the chair of the Forsyth County commissioners, the chief of the Winston-Salem Police Department, three judges, a member of the school board, a member of the N.C. National Guard, the principal of the Career Center, the principal of Walkertown High School and others. There to share in the excitement were Rice’s grandparents, Dwayne and Sharon Tart, and Rev. Bruce Updyke, the minister of the family’s church – Love’s United Methodist in Walkertown. The surprise was organized by the law firm of Daggett Shuler, which has been sponsoring the annual contest for 29 years now. Rice’s design will be printed on 15,000 Safe Sober Prom Night t-shirts distributed to 50 high schools in the Triad. This is the 10th year in a row that a student in one of Messer’s classes won the contest. Messer gave her students credit for that streak. Student Riley Cornatzer, whose home high school is Reagan, said much of the credit should go to Messer. And the way Messer treats everyone is an integral part of what makes her such a good teacher. “We see her as someone we are comfortable speaking with,” Cornatzer said. David Daggett and Griff Shuler presented Messer with a check for $500 to use for class supplies. Along with the honor of having her design printed on so many t-shirts, Rice received a $500 college scholarship. Rice’s design was one of about 200 entries. When the judges looked at the entries, they didn’t know who submitted them. So, they had no way of knowing that, yet again, they were choosing one of Messer’s students as the winner. While everyone was waiting in the Career Center office before heading upstairs for the surprise, the Tarts and Updyke talked about Rice. The Tarts have raised her since she was three weeks old. “She has been a blessing to raise,” Dwayne Tart said. “She is artistic and outgoing,” Sharon Tart said. “They have raised her in a very positive manner – challenged and encouraged her,” Updyke said. The family is quite active in the church. Rice sings in one of the church choirs and has helped in the after-school and summer programs. So they could be there for the surprise, the people at Daggett Shuler had let them know about it beforehand. Not saying anything was rough, Sharon Tart said. “I should get an award for not blabbing,” she said. Once everyone headed upstairs and the surprise was sprung, Rice’s classmates talked about how much they appreciate her as a person and for her talent. “She is very kind, friendly,” Cornatzer said. Rice is a senior. Her current plan calls for going to Guilford Technical Community College next year and majoring in graphic design. From there, she might transfer to Appalachian State University. She envisions a career in which she would design logos, as well as such items for businesses as cards and brochures. Rice is already doing design work for some people she knows. She is doing a logo for someone who is starting a business. Her ideas for designs begin to come to her as she is talking to the person and other ideas emerge later. She likes “retro” designs, she said, and – not counting the 2019 on the Safe Sober t-shirt design – she thinks of it as something that could have been designed in the 1970s. Rice enjoys doing art on her own. The household includes three cats – Twinkee, Lilo, and Stitch. Her life at church and her grandparents mean a lot to her. With the possibility of making it 10 years in a row for Messer’s class, Rice said, she was hoping that someone from the class would win. But she had no idea it would be her. Nowotny, who became a life coach about three years ago, said she decided to write the devotional about nine months ago after encouragement from her own life coach. Nowotny said she wrote the devotional based on wisdom from her personal journals. She explained that as she journals, she sometimes has thoughts or insights that come to her that she attributes to being from God or the Holy Spirit. Nowotny, who attends Project:Re3 and is one of the church’s founding members, explained that her faith is very important to her. Along with being involved with the church, Nowotny homeschools two of her four children and is very involved with the Belarussian Relief Organization. As a life coach and now an author, Nowotny said this is one way she is trying to give back to all of those who have mentored to her, while also giving back to others. “I want to help people live a fuller life, one with more meaning,” she shared. Nowotny explained that the devotional has 52 scriptures, enough for people to reflect on one every week for a year. Along with each scripture, Nowotny has included thoughts about the scripture that have come from her personal journal and how she has reflected on those scriptures. She then asks a question or gives ideas on how the reader can reflect. “Those are the things I have learned to do throughout the year,” she said, adding that every morning, she takes time to do reflective thinking whether it’s reading scriptures or someone else’s book, or listening to a podcast. Nowotny noted that with each scripture, she includes an area for writing notes, as well as a page where people can reflect with bullet points or by doodling. 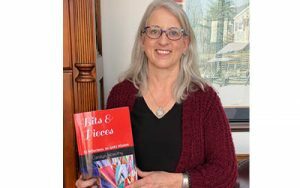 “Not everyone expresses themselves through writing, so I wanted to offer a space for that,” she said as she added that when her son reflects it often comes out as a doodle. “I like this scripture because that is where personal growth starts. We can sit and stay stuck our entire lives and not know that we need to be healed,” she said. While some of the scripture in her book she found by reading the Bible, she said this one was one that her pastor brought up during a sermon, one that he took apart for the congregation. “I just kept coming back to it,” she said. Having never written before, other than on a few blog posts, Nowotny didn’t realize how much she was going to enjoy writing; however, looking back on high school, she said English was her favorite subject. Nowotny noted that the process of writing her book only took about three months and she self-published. The book, which is $12, is now available on Amazon.com and will be available at Local Roots Coffee Bar & General Store, located at 247 North Cherry Street. The Declan Donoghue Foundation, which started in Kernersville with their first playground at Harmon Park, received a Special Citation Award from the North Carolina Recreation & Park Association. The Declan Donoghue Foundation started in February 2011 after Declan passed away in 2010. 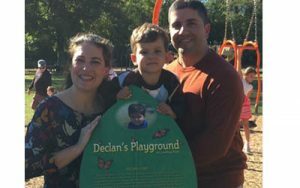 To honor his legacy, Nicole and Rich Donoghue started the Foundation to help keep Declan’s spirit of play alive by building playgrounds throughout the Triad area. Declan was born on May 30, 2008. Nicole said he loved being around people, watching his favorite movies and playing outside. However, he suffered many medical ailments, including pneumonia, abnormal bloodwork and unexplained fevers. While Declan’s parents and doctors tried everything they could to help him, they weren’t able to save him. It wasn’t until after he passed away that doctors discovered he had X-linked chronic granulomatous disease. Nicole said their hope is that these playgrounds will provide joy to children of all ages. Since the Foundation started in Kernersville, it continues to hold their annual Declan’s Dash 5K and Fun Run each spring at the site of the first playground, located at Harmon Park. Nicole explained that they were honored with the award during the state-wide conference held in Winston-Salem earlier this year. After presenting the award to Nicole and Rich, Nicole said they then came to Kernersville and presented the award to them in front of the Kernersville Board of Aldermen. The Special Citation Award is given to people within the parks and recreation industry who have contributed to the industry in a positive way. “Ernie (Pages) and Kernersville Parks and Recreation Department (KPRD), along with Lee Tillery and Nasha McCray, all came together and nominated us because we have built five playgrounds and have given scholarships in Kernersville for kids to go to camp in the summertime,” Nicole explained. While the award was supposed to be a surprise, Nicole explained that they figured it out when Pages, who is the KPRD director, asked for them to be available and to attend the conference. Nicole said they were honored to be selected for the award. Nicole noted that they are still committed to doing camp scholarships this year in Kernersville and plan to start construction on the Foundation’s sixth playground this fall. “With funds raised from last year and this year, we hope to build one this fall in the Triad, but we don’t have a location picked out yet,” she said. For more information about the Declan Donoghue Foundation, visit www.declansfoundation.org. 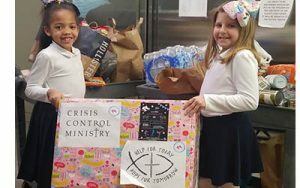 Ahnali Noah, a student from The North Carolina Leadership Academy (NCLA), chose to make her birthday more special this year by collecting donations to help Crisis Control Ministry (CCM). 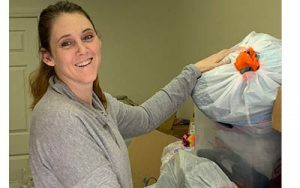 During her birthday party, which was an ice-skating party at the Winston-Salem Fairgrounds on January 21, Noah invited 26 friends and instead of asking for gifts, she asked them all to bring a non-perishable food item. This isn’t the first time Noah has collected items for CCM on her birthday. She also collected food two years ago and decided she wanted to make it an annual tradition. When dropping off the food this year, Noah brought along her best friend, Caroline Linville, and the two were given a tour of CCM. 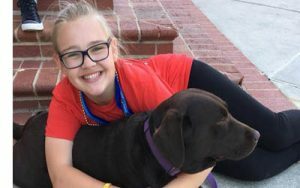 Noah said she likes collecting donations on her birthday because she is not only able to help others, but is also able to teach her friends about giving. “I think they liked it, too, because they got to carry all the food and put it in boxes,” she explained. Noah noted that she and her friends collected a total of 148 non-perishable food items. Noah is a student in Ms. Teves’ third grade class. Noah noted that she dances with Acro through Dancers Edge, and she has been a model with the Carolina Wedding Show for the past three years. Noah added that her favorite subject in school is math and when she grows up, she hopes to be either a model or a chef. As a way to minister to local families, Kernersville Seventh Day Adventist (SDA) Church is kicking off their new God’s Closet ministry on Sunday, March 31 from 12 – 2 p.m. The cost of the event is only $1 and includes new or gently used children’s clothing from infant through teens, as well as bedding. Nicki Williams, who has organized the event for Kernersville SDA, noted that the ministry was started out of Spokane, Washington in 2009 and was adopted by the North American division of Seventh Day Adventists. Williams noted that this is the church’s initial kickoff of the event and while their goal is to do it four times a year, they will likely only do it twice this year, depending on the amount of support they receive. Williams said they decided to hold the event in late March because it will be right after many other spring children’s consignment sales and is a great way to donate any items that didn’t sell. Williams said she recently attended a God’s Closet in Morganton and said it was a big hit. Although the event is only $1 and is intended to help people who are in need, Williams said anyone is welcome to attend and they do not verify income. “All you have to do to come in is fill out a registration card and pay $1,” she said. When collecting items, Williams said they go through them to sort out anything that’s inappropriate or in poor condition. “We sort it all into sizes, so it takes some time to get ready for the event,” she stated. Williams said they are also inviting other community services to set up during the event. One that has already signed up is Safe Swim NC. They will also have free blood pressure checks, information about diabetes reversal classes and more. In the future, Williams said they will probably have more opportunities for people to volunteer during the event and be able to shop while they sort. Williams said they are collecting new or gently used clothing or bedding from the community through March 29 anytime the church is open or you can contact her for other options. For more information or updates about KSDA’s God’s Closet, visit them on Facebook www.facebook.com/Godsclosetkernersville. If interested in participating with God’s Closet, call 336-409-0776. KSDA is located at 896 Old Winston Road. The church is open Wednesday through Friday from 9 a.m. – 1 p.m. and Saturday from 9:30 a.m. – 1 p.m.
Chocolate covered egg lovers take note. Volunteers with First Presbyterian Church’s Easter Egg Ministry are back at work shaping and dipping the decadently delicious peanut butter and coconut confections. They’ve probably already made several thousand, with more to come over the next several weeks. This is the 29th year that First Presbyterian has held its chocolate covered peanut butter and coconut Easter egg fundraiser, an event that raises tens of thousands of dollars annually not only for the church itself, but a number of charities and programs the church supports. Last year, volunteers who meet weekly in the church fellowship hall to hand mix, shape and dip either peanut butter or coconut filling shaped like Easter eggs into crockpots of heated chocolate, produced approximately 74,000 individual eggs. The group works for seven weeks leading up to Palm Sunday, mixing, molding, dipping and wrapping the confections. 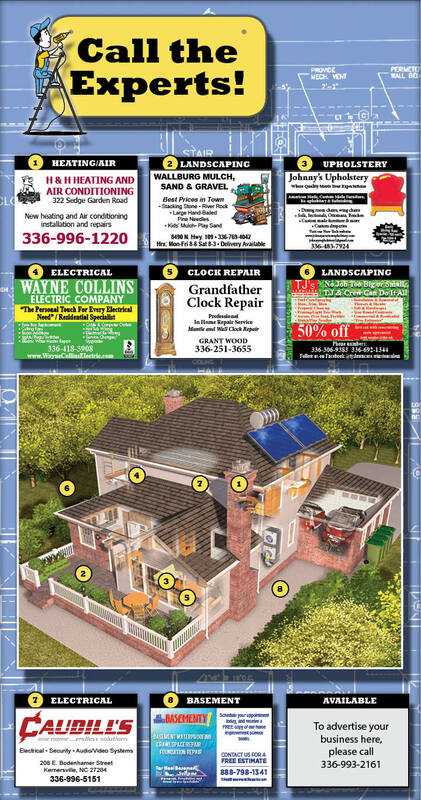 They are then sold on site, either through advance orders or walk-ins, or dispersed for sale at various businesses and organizations throughout town. Not only are the eggs popular to consume, but they’re popular to make, as well. That’s evident in the number of volunteers from outside the First Presbyterian Church community who seek to help with the production of the eggs. 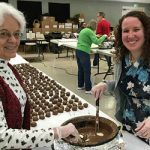 According to church member Ellen Watts, who handles sales of the chocolate-covered eggs for the ministry, volunteers come from all over the area to help make the chocolate eggs. “The volunteers come from all over the Triad. They’re from many different faiths and many different communities,” Watts said. On Tuesday, Kernersville Library Children’s Librarian Stephanie Kellum was there helping for a second year in a row because of the support the library’s children’s program gets from the ministry. “They help us, so I want to help them,” Kellum said. The church began its Easter Egg Ministry as a way to pay off a $250,000 mortgage on its new fellowship hall. The church looked at a number of avenues on how it could raise the money needed, but there’s only so much money to be made from bake sales featuring cakes and cookies. Church member Donna Myers was determined to find a solution. She asked her husband’s boss if he had any ideas on fundraising projects. A few weeks later, he sent Myers an article about an Easter egg project at a church in Pennsylvania where church members were producing 214,000 eggs each year and selling them for 45 cents each. Myers called the church and asked about the egg project. The church not only agreed to send Myers information about the eggs, but the recipe as well. They just had one condition: that First Presbyterian Church never reveal the recipe. To this day, that recipe is a closely guarded secret. The first year the church produced the chocolate covered eggs, they raised $3,000. By 1999, they had raised $114,000 to help retire the church’s mortgage early. In 2015, First Presbyterian celebrated the silver anniversary of its Easter Egg Ministry by producing a limited edition of coconut eggs hand-dipped in dark chocolate. This year, the church is adding a peanut butter egg dipped in dark chocolate to go along with the dark chocolate coconut egg that still remains from the celebratory silver anniversary milestone. Those will not be available for purchase until March 15, Watts said. Watts said the church does receive requests for mail orders. She said a woman recently called from Florida asking if an order could be shipped to her. Turns out, the woman used to receive the eggs in the mail each year, sent to her by a family member. With that connection no longer available, she called the church directly. “We don’t ship orders,” Watts had to tell her. Last year, the Easter Egg Ministry provided support to the following organizations and programs: Kernersville Police Department’s Camp for Kids, Kernersville Fire Rescue Department’s Safety Seat Program, Crisis Control Ministry, Next Step Ministries, gift cards for local student needs, Kernersville Library for children’s books, Kernersville Police Department’s Christmas Shop with a Cop program, and First Tee of the Triad. In addition, the Egg Ministry provides support for First Presbyterian’s scholarship fund and youth mission activities. Chocolate covered peanut butter and coconut eggs can be ordered by calling the Easter Egg Ministry phone number at 336-515-4999 or by ordering through the church’s website at www.fpkernersville.org. Eggs are $1 each. The church does not mail or ship orders. All orders must be picked up at First Presbyterian Church, located at 611 Oakhurst Street. Eggs may be picked up Monday, Tuesday, Thursday and Friday from 9 to 11:30 a.m. and 1:30 to 4 p.m. Wednesday pick up hours are 1:30 to 4 p.m.
All orders must be picked up by April 11. Those who order by phone or online must allow 24-hours for an order to be filled. First Presbyterian Church is located at 611 Oakhurst Street. 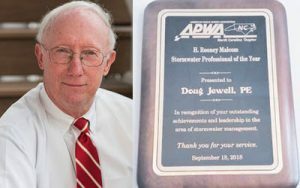 Doug Jewell with Jewell Engineering was named Stormwater Professional of the Year by the North Carolina American Public Works Association (APWA) and was presented with the H. Rooney Malcom Award. The presentation was made at the annual NC APWA Stormwater Division Conference in Winston-Salem. The award recognizes Jewell’s 40-year career as a stormwater professional and his accomplishments in the design of many physical stormwater structures in North Carolina and neighboring states, his guidance to local municipalities in developing and implementing stormwater management programs and utilities, and his overall support of stormwater engineering and management as a professional endeavor. This award is named in honor of Dr. Malcom, who was a long-time teacher at North Carolina State University (NCSU) and mentor and friend to stormwater professionals across the country. Jewell grew up in Wilmington. He attended the University of North Carolina at Charlotte where he earned a degree in zoology and then spent five years in the Navy’s officer candidate school as a flyer. After serving five years active duty, he returned to earn his undergraduate degree from NCSU in water resources in civil engineering in 1979 and a Master’s in Civil Engineering with a concentration in water resources from NCSU. Jewell explained that after thinking about it, water resources made sense because it’s something he has always enjoyed. “Everything that I’ve enjoyed since I was a child has been around the water – fishing, sailing, etc.,” he said. Jewell, who continued to serve in the Navy reserves until he retired in 1996, moved with his family to Kernersville in 1983. He started Jewell Engineering in 1996 and moved into their current building on South Main Street in 2000. Jewell and his wife, Nancy, have three children – Doug, Matt and Jane. Although he is located in Kernersville, Jewell explained that Jewell Engineering works mostly with local governments across the state, from the mountains to the coast. Jewell added that they also do a lot of dam engineering, including one for the Lumbee Tribe in Robinson, NC that was 6,000 feet long, and at Century Park Lake in Kernersville. Jewell said they also help local governments develop stormwater programs. Jewell said what he enjoys about stormwater is the people and seeing a finished project. Upon receiving the award, Jewell said he was most honored that it was an award named after Dr. Malcom. Looking back over his 40 years in stormwater resources, Jewell said it isn’t the work that he has done that he remembers.